Widely used in South Asian cooking, the sweet and aromatic fennel seed comes from a perennial herb plant that belongs to the parsley family. It is indigenous to the shores of the Mediterranean, from where it spread eastwards to India. Well known to ancient civilizations, the ancient Romans cultivated the fennel plant for its aromatic seeds and succulent shoots. In the 1200s, England used fennel seeds to suppress appetites during days of fasting. It was even used to keep stomachs from rumbling. Similar to star anise in flavour, the fennel plant bears sweet aromatic seeds and thrives in all climates and soils. It grows in Northern Europe, United States, Southern Canada, and most of Asia and Australia. This herbaceous plant reaches up to 2 meters in height with deep green feathery leaves and golden-yellow flowers. In general, fennel seeds are harvested when their seed heads turn light-brown. The seeds have an oblong or curved shape, are light brown in color with fine vertical stripes over their surface. Generally, fennel seeds are harvested during the early hours of the day or late afternoon as the presence of moisture helps prevent the seeds from shattering. The cut plants are stored until they are dry and then threshed, processed, and packed to be sold in the markets. 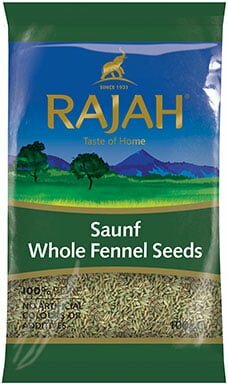 Fennel seeds possess a sweet aromatic flavour which helps balance dishes with a hint of sweetness. They’re known as an essential component of the Bengali panch phoran (five spice blend). Store your supply of dry fennel seeds in a clean airtight container, kept in a cool, dry and dark place. Ground and powdered fennel should be stored inside the refrigerator, in airtight containers and should be used sooner as it loses flavor quickly due to evaporation of its essential oils. Fennel has long been used as a remedy for flatulence and indigestion in traditional medicines. In fact, you may have finished many a heavy meal at a South Asian restaurant with a teaspoon of fennel seeds mixed with sugar. Fennel water is often used in newborn babies to relieve colic pain and help aid digestion. Fennel seed oil is used to massage painful joints as well as relieve coughs and bronchitis. Apart from this, fennel has many health benefiting nutrients, essential compounds, anti-oxidants, dietary fiber, minerals, and vitamins.